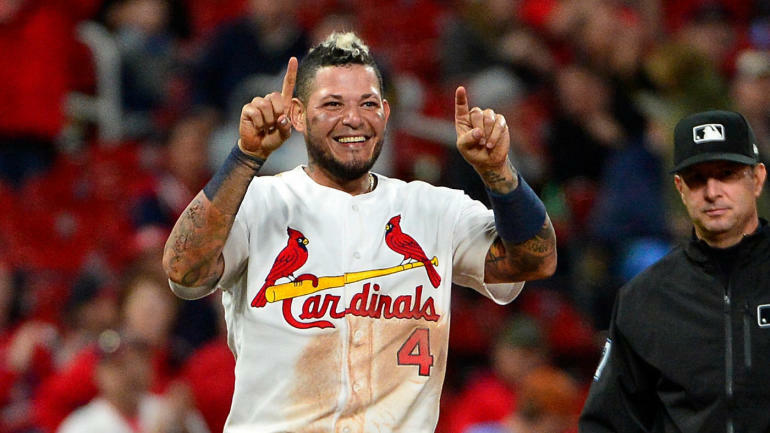 Will Yadier Molina's Knee Injury Lead to Cardinals Second-Half Collapse? To say this week has been generally devastating to the St. Louis Cardinals would be the ultimate understatement. The Cardinals lost six games in a row (three to the division rival Pittsburgh Pirates), relinquished first place and apparently left their offense back in St. Louis. Rumor has it the airline lost the crate that was carrying their luck. As if that wasn’t enough, in the second inning of the second game in Tuesday’s double-header, the Cardinals lost their Gold Glove catcher, Yadier Molina. Is that a terrible loss? Of course, it is. Does it mean the Cardinals should box up their cleats and head home for the winter? The answer to that one should be obvious to the rational, free-thinking homosapien-types. Molina is the key cog to this team in several ways—but he isn’t a one-man show. I’m not trying to minimize the issue. I know what Molina means to the pitching staff, the offense and even the clubhouse, but at the same time, I’ve seen them push through other times of adversity. They have survived and thrived through the loss of Albert Pujols, Tony LaRussa, Dave Duncan and Chris Carpenter. They’ve done it all with a record number of rookie players and even a rookie manager thrown into the equation. Not only has the team survived, they’ve remained in contention. Now that we have a better idea of what Molina is dealing with in his knee, it’s ok to breathe at least a partial sigh of relief. Had there been structural damage found that required a longer shut down or possibly even surgery, this could have been an uglier situation. The Cardinals can weather two weeks without him. It’s obviously not the ideal situation, but if the offense comes back around, it is manageable. Tony Cruz isn’t the perfect replacement for Molina, but he’s good defensively. With regular playing time, his bat should be serviceable as well. The loss of Molina’s offense and defense concern me less than what he brings to the pitching staff. Every pitcher on this staff credits Molina’s leadership behind the plate before taking any credit for themselves. That is where Molina’s influence will be missed. For more experienced pitchers like Adam Wainwright and Jake Westbrook, there’s not a lot to worry about. With younger guys like Shelby Miller, Lance Lynn, Trevor Rosenthal and even Edward Mujica (who isn’t so young), there could be a noticeable difference. In the end, if this turns out to be just a 15-day absence as expected, the Cardinals should be able to hold it together. With that said, it all hinges on the return of the Cardinals offense that has gotten them to where they are today. They showed signs of coming around Wednesday night—but they need more than signs now, with Pittsburgh sitting on a 2.5-game lead in the NL Central.